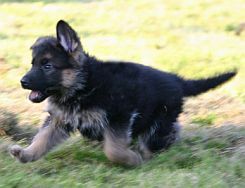 The German Shepherd Dog Breed Council began life in 1986 and is made up of GSD Clubs from all over the British Isles. 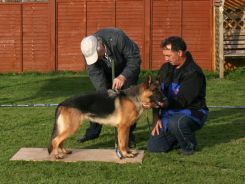 Representatives from the member clubs meet regularly to discuss all aspects of the breed with the objective being the advancement of the German Shepherd Dog. This forum for discussion enables the clubs to speak with a united voice. The Kennel Club rules prevent an individual person from becoming a member in their own right, and anyone wishing to join the council would do so by becoming part of a member club. Find your nearest Member Club by clicking on the link above. A Breed Survey Scheme which takes place all over the country with full reports on surveyed dogs being published in the GSD National Magazine. A Blood Screening Scheme to locate haemophiliac males, and through them the female carriers. A glossy monthly GSD National Magazine. An illustrated version of the KC Standard. Both entertaining and educational, these are a must for any true GSD enthusiast. For more information please contact The Secretary (see Contact page). Click here for the latest Survey Form. The front page of this new form is 'fillable' using the later versions of Adobe Reader. Save the form to your computer, open it with Adobe Reader XI or Acrobat Reader DC and type in the blue shaded areas. This will improve legibility and reduce delays in the production of Survey Certificates.